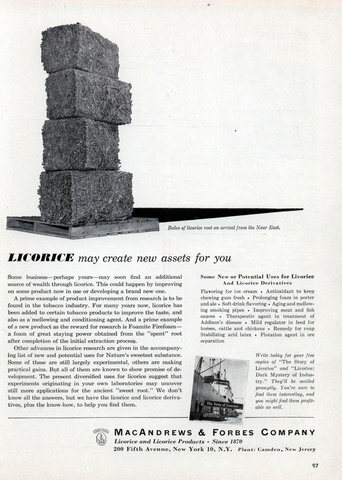 Some businessâ€”perhaps yoursâ€”may soon find an additional source of wealth through licorice. This could happen by improving on some product now in use or developing a brand new one. A prime example of product improvement from research is to be found in the tobacco industry. For many years now, licorice has been added to certain tobacco products to improve the taste, and also as a mellowing and conditioning agent. And a prime example of a new product as the reward for research is Foamite Firefoamâ€” a foam of great staying power obtained from the “spent” root after completion of the initial extraction process.